Have you ever worked with someone who inevitably managed to come up with things to do that were a complete waste of time? Maybe it was an insecure boss who was never confident about what he was doing, so he went for the “everything and the kitchen sink” approach to generating deliverables in the last few days before the deadline. Or maybe it was a fellow student on a group project, someone so diligent (cough, cough) that she wanted to turn in a 20-page report when the teacher suggested 10 pages (and actually specified a 12-page limit). You know who I’m talking about, right? We’ve all run across these situations in our academic or working lives. You want to be polite…but you also want to get your work done and not waste time on activities that don’t really help you reach the overall goal. Okay, the test writers are not literally sitting there cackling and saying, “How can we get them to waste their lives?! ?” But the overall sentiment still holds because of the way that the GMAT is constructed. You already know the classic “If you get something right, they give you something harder” pattern, right? Well, at some point, that “something harder” is going to be something that isn’t worth your time. You’re probably not going to get it right no matter what you do. Even if you do, you’re going to use up valuable time that you could be using on other problems. Most important of all, you’re going to be using up your finite brain energy on something that probably isn’t going to pay off. How many times in your life have you crashed towards the end of a test or a long day at work because your brain just couldn’t keep going any longer? 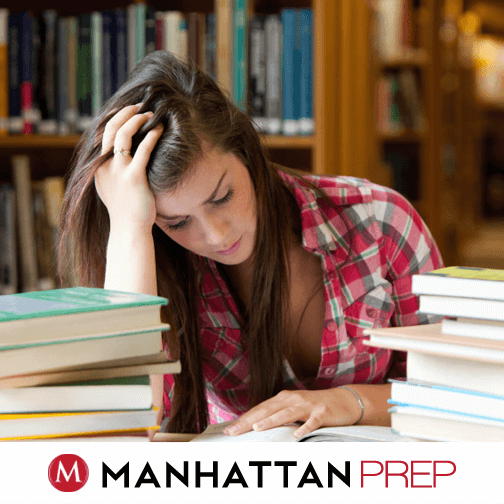 The GMAT is a “where you end is what you get” test: if you crash before the end of the section, your score will suffer greatly. This is basically no different than that co-worker who’s trying to get you to build a marketing presentation when the client has specifically requested that you analyze the pros and cons of acquiring a competitor. Tomorrow at the client meeting, it won’t matter how good your intentions were. Your client is going to be mad that you wasted time on something that doesn’t actually help them. Official Guide, 2015 Edition: What do you need to know? 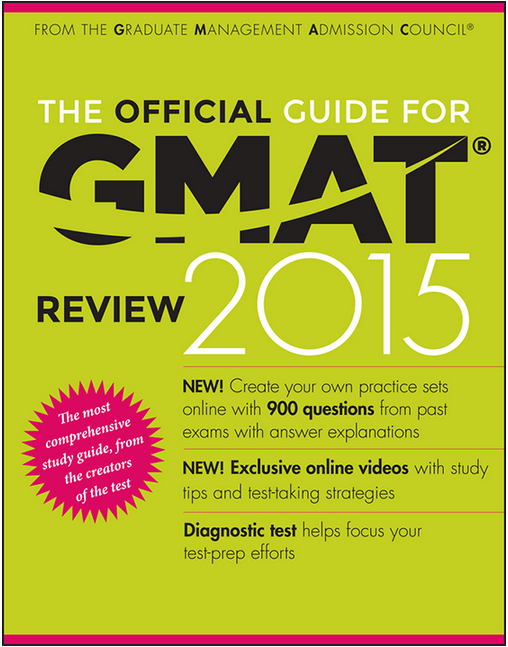 GMAC just released new 2015 editions of its three The Official Guide for GMAT® Review books. Here’s what you need to know as you decide whether to buy these books and how to use them. The three books in question are The Official Guide for GMAT Review 2015 (formerly known as the 13th edition of the Official Guide, or OG), The Official Guide for GMAT Quantitative Review 2015 (formerly known as the 2nd edition of the Quant Review), and The Official Guide for GMAT Verbal Review 2015 (formerly known as the 2nd edition of the Verbal Review). I’ll refer to these throughout this article as OG2015, QR2015, and VR2015, respectively. The questions (and explanations) contained in all three 2015 versions are the same as the questions (and explanations) in the previous versions. There are no new questions. The online software also has some short videos (one for each book) starring the incomparable Dr. Lawrence Rudner, Chief Psychometrician for GMAC, answering frequently asked questions from students. The software for all three books gives you the ability to choose Practice mode or Exam mode. In addition, OG2015 offers a Diagnostic test mode that contains the questions from chapter 3 of the printed book. – Question Type, Number, and Difficulty. You can choose from among the different question types (PS, DS, SC, CR, RC), as well as by difficulty bucket (easy, medium, hard, or all). You can also decide how many questions you want to be in the set. – Bookmarks. You can bookmark problems that you want to remember for some reason—maybe your guesses or the ones that you want to try again before checking the answer or explanation. – Calculator. Yes, the software offers a calculator, even though you’re not allowed to use a calculator on the quant section of the real test. My recommendation: pretend this button doesn’t exist. – Pause. You can pause the question set. This is useful if someone suddenly rings your doorbell, but do not pause the software while continuing to work on the problem. Otherwise, your data will be skewed and you won’t really be able to tell what your strengths and weaknesses are. In the Diagnostic and Exam modes, you can only move forward in the question set (as on the real exam), but in Practice mode, you can move back and forth. If you come back to a problem for the second time, the software will actually remember how much time you spent before and will start counting your time where you left off! I was really impressed with this feature. I do have to warn you about three other somewhat-faulty features (maybe these will be changed in future). First, when you click to go to the next question, the software does not ask you to confirm. That’s fine in Practice mode, where you’re allowed to go backwards, but in Diagnostic and Exam modes, if you accidentally click “next question,” you will be moved to the next problem even if you have not yet entered an answer—and there is no way to go back. Third, in both Practice and Exam modes, the RC questions are offered one at a time, not in sets of 3 or 4 (as on the real test). For this reason, I recommend doing RC questions out of the physical book. Reading an entire passage only to answer a single question is not a good use of study time. I was also excited to see that the Practice mode offered a “notes” feature, where you can actually type notes to yourself while working on the problem. I was disappointed that those notes seemed to disappear afterwards. When I was reviewing the results screen and the problem explanations, I couldn’t find any way to access my notes again. How do I get the most out of these new books? If you already have the previous incarnations of these books (OG13, VR2, and QR2), then I don’t actually recommend buying the new editions unless money is not a concern for you. The most important thing is to have access to the questions themselves. While the new software does make it much easier to set up problem sets, many people probably aren’t going to pay $46 just for that. 2. As you work through whatever material you’re using to learn all about the math, grammar, and question types tested on the GMAT, you will initially try just a couple of OG problems that directly test whatever you recently studied. In this case, you won’t be using the OG software because the software doesn’t let you select by topic. After you get at least halfway through your study material though (e.g., about 3 of our 5 quant books, or halfway through the chapters in the SC book), you can start to set up random sets of questions for yourself using the software’s Practice mode. When you’re offered a question on a topic you haven’t studied yet, just do your best; this will help you to have an idea of your strengths and weaknesses so that you know how much time to spend when you do get to that topic. Whether you want to do random sets of problems or choose specific topics, here are some guidelines for creating your own OG problem sets. 3. Save Exam mode for a bit later in your studies, after you’ve been through all of your main study material once. Both Practice and Exam modes are pulling from the same pool of questions, but Exam mode imposes some additional restrictions that make your practice closer to the real test (for example, you can’t go back to questions that you’ve already completed). Everyone should be studying with the Official Guide materials—nothing is better than the real thing! If you already have the 13th edition or 2nd edition books, don’t feel that you must buy the 2015 editions, but if you don’t, then certainly get the latest versions and take advantage of the new online problem set program. Win GMAT Interact! Photo Caption Contest Begins Today. So you’re smart, clever, and creative? … Then you’re going to love this photo caption contest! 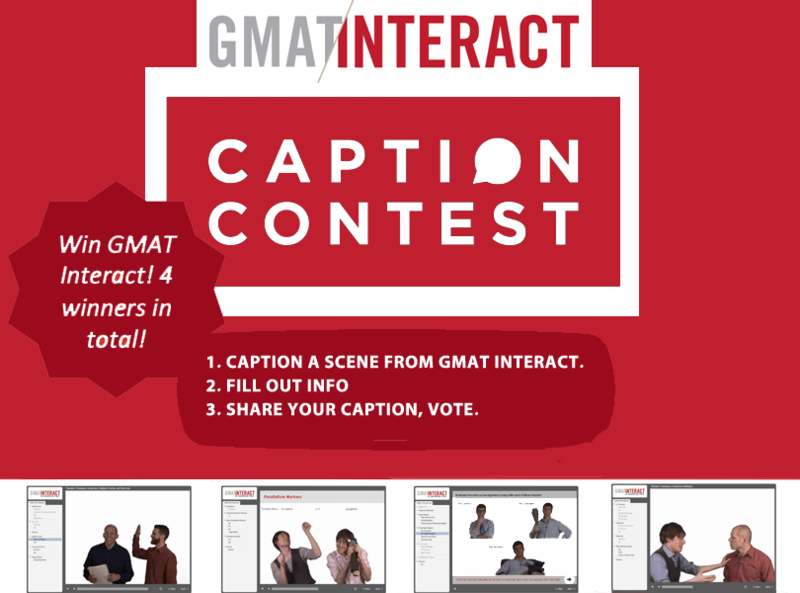 Once a week for the next four weeks we’re going to post a photo of a scene from GMAT Interact on our Facebook Photo Caption Contest page for you to caption for your chance to win GMAT Interact™ (a $899 value)! Every Monday for the next four weeks, we will be posting a photo of a scene from GMAT Interact on our Facebook Photo Caption Contest App for you to caption. Our weekly winner will be announced each Monday when we post the new pic to quote! Judging is based on creativity and votes accumulated on captions — so be sure to share your caption with your friends, and encourage them to vote for you. So what are you waiting for? Head on over to our Facebook Photo Caption Contest now to see this week’s photo and be sure to check back next week for the winner!